Panamanian President Ricardo Martinelli has announced his country has seized a North Korean-flagged ship carrying “undeclared military cargo”. Ricardo Martinelli told local media that the ship, which was sailing from Cuba, contained suspected “sophisticated missile equipment”. 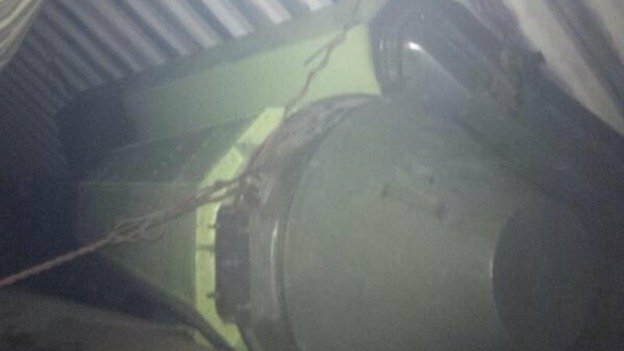 He posted a photo of what looked like a large green object inside a cargo container on his Twitter account. Ricardo Martinelli said the ship, which was searched on its way into the Panama Canal, was being held for further investigation. The ship was stopped near Manzanillo on the Atlantic side of the canal. Ricardo Martinelli said the authorities were checking the ship for drugs when they found the suspected weapons in containers of brown sugar. “We’re going to keep unloading the ship and figure out exactly what was inside,” he told local media. The 35-member crew have been detained, including the captain who the Panamanian president said tried to kill himself during the search. Security Minister Jose Raul Mulino said the ship “aroused suspicion by the violent reaction of the captain and the crew”. Sanctions were strengthened after its third nuclear test on February 12, including measures increasing states’ authority to inspect suspicious cargo. In recent years a number of North Korean ships have been searched under the UN sanctions. In July 2009 a North Korean ship heading to Burma was tracked by the US navy on suspicion of transporting weapons and subsequently turned around. North Korea has an ongoing missile development programme. In December it launched what it called a three-stage rocket to put a satellite into space. The move was condemned by the United Nations as a banned test of missile technology. Experts believe the communist state is working towards developing a nuclear warhead small enough to put on a long-range missile.